A Tiny Bottle With A LOT Of Information. The laws on e liquid seem to be in a constant state of flux (just like the vaping technology!) and with the Brexit looming, there are probably lots more changes to come. As rules become more regulated in this growing industry, suppliers will need to ensure their e liquid labels are fully compliant with whatever the regulations may be at that time. … All that is just a snippet of the information displayed on bottles – as you’ll see later in this blog! The industry was estimated to be worth over £340 million in 2015 with an estimated 1.3 million vapers in the UK . As a result, tobacco manufacturers have taken a big financial hit as the healthier alternative is taking over and more and more regulations are coming into play. But that was last year. Depending on the sources you check with, it’s estimated the industry has grown by well over 25% in the last year alone… Holy smokes! A tactile warning label, compliant with EN ISO 11683, must be clearly displayed on the e-liquid bottle packaging This will need to be applied separately to the main label as there are of course regulations to the size and thickness – and it must remain tactile for the estimated lifespan of the product. We do (of course) provide these and it’s not just e-liquid bottles you’ll see them on. 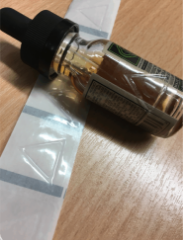 Any product classed as harmful or potentially-hazardous should bear a tactile warning triangle, so these popular little stickers can be seen pretty much everywhere: But nowhere more so than on trusty bottles of e-liquid. Importantly, your labels help to make your product easily identifiable and build an instantly recognisable brand. 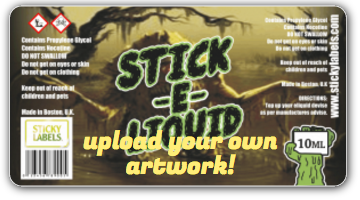 We understand that you’ll likely have a pre-created design that you will want to upload – and you can do this via our online label designer! Provided you already have all the relevant info on the sticker you can simply upload your design, pick your size and select your amount. 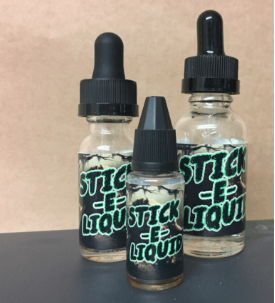 It really could not be easier, and considering the cost of equipment and rate at which the goalposts are moved for the correct displaying of information on e-liquid, you’ll find this the cheapest option for e-liquid label production. Bear in mind that UK e-liquid does have rules regarding the designs on the bottles, but again, these may be updated in the future. Although you are required to list ingredients present in the e-liquid, you don’t have to provide all the specifics. For instance, the concentration: PV and VG ratio or the exact mix of flavourings which may be a closely guarded secret. Again, this may change as the legal requirements change. But… You’ll have to clearly display the nicotine ratio. It’s often the case that shorter volumes of e-liquid will simply have tick boxes for the ratio of nicotine: for example 0%, 0.3%, 0.6%, 0.12% etc. This is just as important as anything else on the label. Not only will it fulfil a legal requirement, but it matters greatly to the vaper who may wish to reduce the nicotine level as they change vaping equipment and potentially want to cut right down on the levels in nicotine in their e juices. Given the number of companies producing e-liquid in the UK, it is imperative that a premium quality image is maintained as well as the quality of the e-liquid. In many cases, customers will judge a book by its cover and base a sale on the look of the product… Initially at least, then the flavour will dictate a returning client! So don’t take the risk of wasting a lot of money on huge runs of labels and expensive equipment to print them: Use a company like Sticky Labels to print the labels for you. You can even use our label maker design function or simply upload your own design and we’ll print and dispatch quickly – typically within just 2 days of receiving your order! Not only that, but we deliver for free… So save yourself time, stress and money by getting in touch!